Veep’s Peter MacNicol’s Emmy nomination has been revoked. 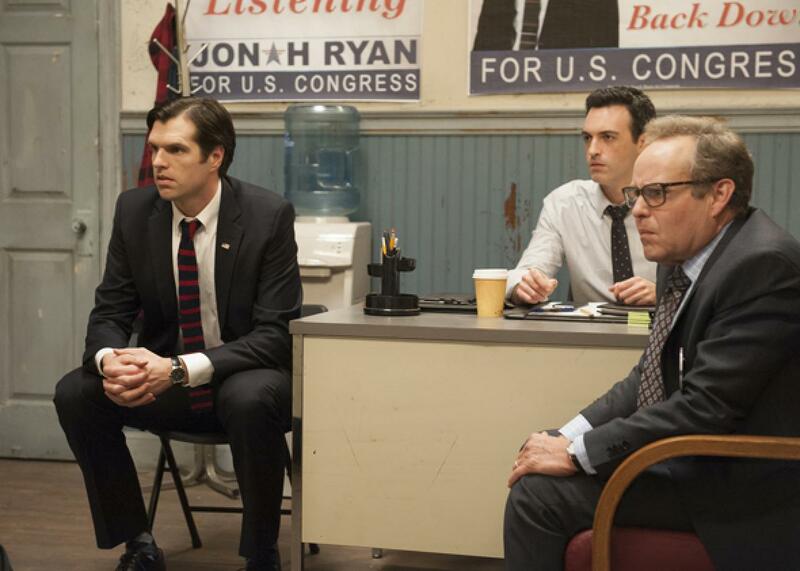 Timothy Simons, Reid Scott, and Peter MacNicol on Veep. Six days after being nominated for an Emmy for outstanding guest actor in a comedy series for his role as Jeff Kane on HBO’s Veep, Peter MacNicol has been ruled ineligible for the award and had his nomination rescinded, according to the Hollywood Reporter. The Academy of Televison Arts and Sciences will announce the actor who received the next highest number of votes in the category as the replacement nominee soon. MacNicol was disqualified for appearing in too many of the show’s episodes; the rules require that a guest actor nominee be in less than half of a season. At the time his name was submitted for the Emmy, Veep was still in production, and HBO anticipated that he’d appear in four of the season’s 10 episodes. Subsequently, however, he was included in 10 seconds of footage in the show’s ninth episode, a documentary supposedly assembled by the daughter of series lead Julia Louis-Dreyfus’ President Selina Meyer. Those 10 seconds meant he was in 50 percent of season’s episodes and disqualified him. The academy released a statement explaining the situation and added, “This decision is in no way a diminishment of Mr. MacNicol’s stellar performance on this season of Veep.” MacNicol joins Dennis Miller and Henry Winkler as actors who were found ineligible for Emmies after they had been nominated. *Correction, July 21, 2016: This post originally misspelled Ally McBeal.